Does the grey stuff in the bowl look like common mud to you? Maybe for us but definitely not for our paleontologists! This is a very special part of the core, delivered quickly to their lab soon after the core reached the core deck. These sediments were in the core catcher, at the bottom of the core. They are the oldest sediments of each core that we recover and our paleontologists come at each “core on deck” call on the catwalk to receive their special gift. They must quickly determine the age of the sample, and relay that to the science team. 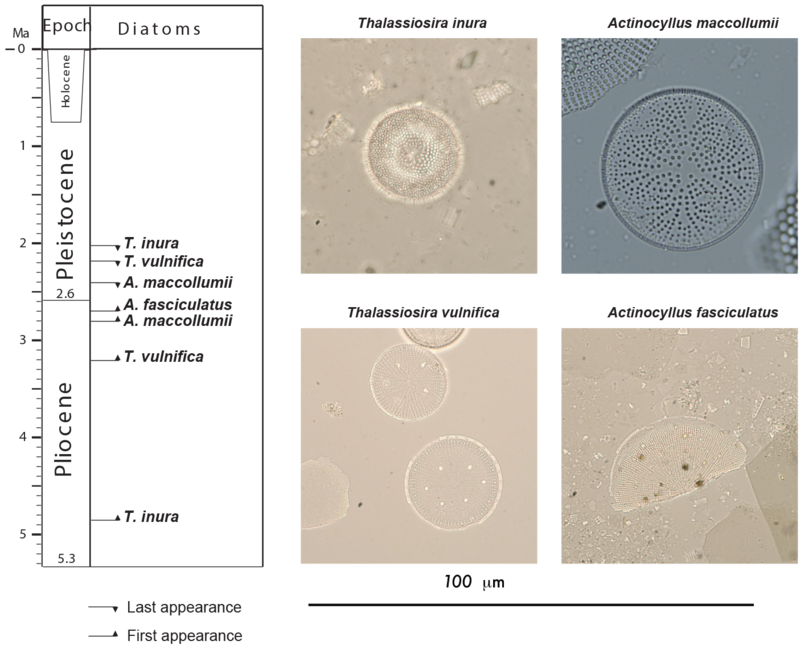 Tracking the age of sediments using microfossils? Paleontologists will determine the age of sediments by using the microfossil assemblages contained within them. In order for this approach to work, the fossils used must be widespread geographically and the sediments must contain a lot of different species. Let’s try to do the job of one of them, Giuseppe Cortese, our radiolarian micropaleontologist onboard during Expedition 374. In this hard mud, Giuseppe will find tiny glass skeletons of radiolarians and use the species found in the core catcher to give an estimation of the age of the sediments. But, before putting ourselves in his shoes, we have to keep in mind that species are not unchanging. They appear, evolve and disappear. Some of them evolved slowly and have existed for long time periods. Therefore, these fossils don’t provide a very good estimate of the age of the sediment. Short-lived species make our micropaleontology team happy. So now, it’s your time to play. By using this partial Radiolarian zonation below, you should be able to estimate an age for that core. 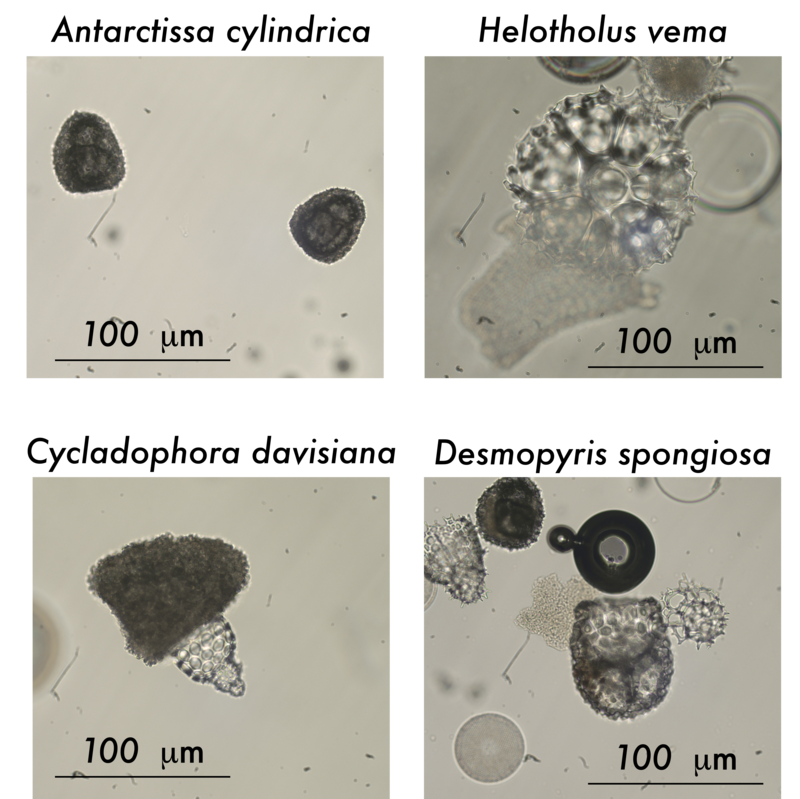 The fact that we find the species Antarctissa cylindrica in the sediment tells us that the age of that sample is older than 0.64 Ma as this species went extinct at 0.64 Ma and therefore should not be found in sediment that is younger than that. The presence of Helotholus vema gives is more helpful because this species only lived between 4.59 and 2.40 Ma. The first appearance of Cyladophora davisiana is at 2.61 Ma. As we find this species in the same sediment sample as Helotholus vema, this means that we can narrow our time interval down to 2.61 to 2.40 Ma (around the end of the Pliocene to the early Pleistocene). The first appearance of Desmospyris spongiosa is less well known (around 2.46 Ma), which is why it isn’t on the zonation chart above, but the approximate age of its evolution is coherent with our previous estimation. 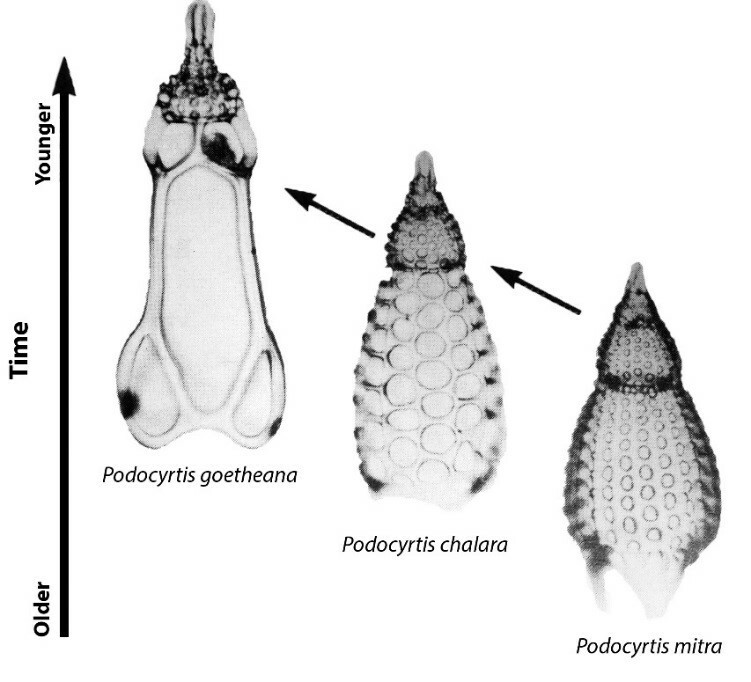 Have you noticed that radiolarians are not alone in the slides? Some diatoms also hide in this sample! Now, it’s time for David Harwood, our night shift diatom specialist, to play. Will you be able to estimate the age of the sample using the fossil diatoms that he has found? Thalassiosira inura lived from 4.9 Ma to 2 Ma. David also found Thalassiosora vulnifica in this sample. This species allows us to limit the time interval of the sample to between 3.2 and 2.2 Ma. Actinocyclus maccollumii provides an even better constraint on the age because its first appearance is at 2.8 Ma and its last appearance at 2.4 Ma, and because Actinocylcus fasciculatus first appeared (evolved) at 2.7 Ma, David can estimate a time range for this sample of 2.7 to 2.4 Ma. 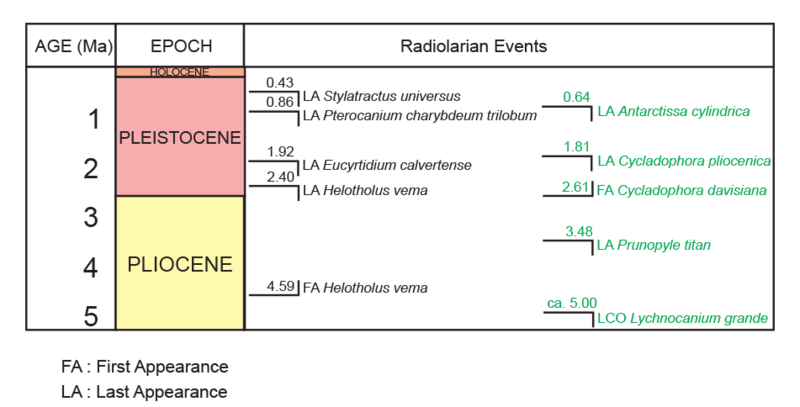 So, according to Giusseppe and David, whose data agree, our core catcher sample is estimated to be 2.6-2.4 Ma, which means at the end of the Pliocene to early Pleistocene. Why use so many species? Why is one short lived species not enough? Targeting the age of the cores is not the only skill of our paleontogists on board. They are also able to estimate former oceanic temperatures, for example, or whether the oceans were cold enough to freeze. Stay tuned if you want to know more about this topic!